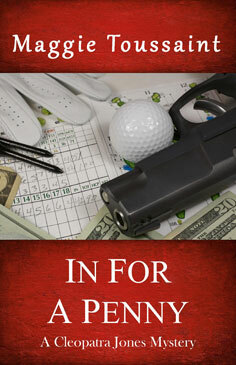 When irrepressible accountant Cleopatra Jones overshoots the sixth green, her golf ball lands in the biggest hazard of her life, the inseam of a dead banker. Murder rocks this small Maryland town and old secrets cast suspicion on Cleo’s best friend. Cleo sets out to prove her friend is innocent. Her sleuthing is hampered by her damaged instincts, a jumbo dog, and her wacky, engaging family. As head of the household, Cleo will do anything to protect her children. “Reading a Cleopatra Jones mystery is a nice way to spend an afternoon. This lighthearted story has a dash of romance and a lot of humor. Cleo is a delightful character, and her wacky family and friends add to the enjoyment.”– ROMANTIC TIMES, 4 stars. The golf course is one of the few places I don’t have to pretend. Oh, I still give the socially correct answer of “fine” when asked how I am, but I am not fine. There’s enough anger churning through my gut to fuel a volcano. Golf therapy is how I’m relieving my stress. I imagine my ex-husband’s face on every ball I hit, and when I’m done, I’m almost fine. My name is Cleopatra Jones, Cleo for short. Self-employment allows me to spend my Wednesday mornings playing golf in the Ladies Nine Hole Golf League. So far in today’s round, I hadn’t experienced any signs of rebirth into a nicer, perkier thirty-five-year-old, but I hadn’t given up hope. Sunbeams danced around me on the number six ladies tee of the Hogan’s Glen Golf Club as I aimed my shoulders at the distant flag. I swung hard. My tee shot hooked left into the trees lining the fairway. I whacked my driver against the ground. Exorcising Charlie through golf was therapeutic to my mental health, but it was hell on my golf score. “Provisional ball,” Jonette Moore suggested. People thought of Mutt and Jeff from the comics when they saw us together because I was tall and slender while she was short and stacked. I’d known Jonette since forever, a fact she never let me forget. Jonette’s tee shot taunted me with its perfect lie in the middle of the fairway. By mutual agreement we’d decided that the winner of the previous round got to drive the golf cart. I can’t remember when I last drove Jonette around the course. I dropped my provisional ball on the tee box. Hitting this second ball would speed our play if I couldn’t find my first ball. Unfortunately, my provisional ball curved along the same evil trajectory into the woods. Drat. I stomped back to the cart. “Looks like you’ll be buying more golf balls,” Jonette said with a smirk. “Have you given any more thought to going out with that lawyer friend of Dean’s?” Jonette asked as we zipped towards the woods. Dean was the current man in Jonette’s life. He was also her boss at the tavern where she waited tables. “That development is wishful thinking and you know it.” The much-hyped new subdivision on the old Wingate farm had stalled in the bulldozer phase of construction. Jonette rolled her eyes and huffed her disapproval. Too bad. If I could erase Charlie from my life, I would, but his weekend visitations with our two daughters put him on my schedule every week. Shedding Charlie was more difficult than getting fungus out from under a toenail. Just when you thought you had the problem solved, there it was again. I marched into the thicket alone, kicking through last year’s musty leaves as I searched for my golf balls. A gleam of white beckoned in the honeysuckle-scented shade ahead. Both balls lay adjacent to each other. That brought a fleeting smile to my face. Hell, if I couldn’t hit straight I’d settle for consistent. “Got ’em,” I called to Jonette as I pocketed my provisional ball. A massive maple stood between me and the number six green, blocking forward progress. I had no choice but to chip out of the rough and hope for distance on my next shot. Of course if I missed and hit the slender trunks of the myriad of smaller obstacles between me and the fairway I’d quite possibly lobotomize myself. Fair enough. Back in the woods, I took aim at Jonette and whaled away. My ball skimmed over the top of her head and landed in the center of the fairway. Success tasted sweet in my mouth. “Hot damn! I’m on a roll.” I jogged back to the cart and noticed Jonette had a death grip on the steering wheel. Served her right. I thumped her on her back. I was still furthest from the hole, so I exchanged my wedge for a seven iron. In truth, I didn’t see the point of having so many clubs in my bag when my trusty seven worked well for any occasion. I took a deep breath and swung easy. My ball landed twenty yards ahead of Jonette’s. Counting all my strokes, I lay three to her one, but that was beside the point. If the world ended right this minute, my ball would still be closest to the pin. That was worth a lot. The golf gods must have taken a lunch break because my next shot zoomed over the green and down a steep embankment. I grabbed a club and started down the hill. Using my golf club as a cane, I crabbed sideways down the hill, scoping the terrain near my feet for my ball. At the base of the hill, I saw something that resembled a bundle of clothes. “I’ve got a real bad feeling about this,” Jonette said. “You and me both.” The closer I came, the more certain details stood out in my mind. I saw that the bundle of clothes was actually an expensive business suit. Pinstriped trouser legs were rolled up to reveal dark crew socks and black-and-white golf shoes. The man lay on his back staring straight up at the cloudless sky. Between his slate-gray eyes was a dark circular wound. Bloodstained grass framed his lifeless head in a grotesque abstract shape, as if some wicked cartoonist had thought to ink in the conversation. Only there was no conversation coming from this person. He was dead. Very dead. My personal problems receded in a heartbeat. I fought down dizzying nausea as I felt my blood charge through me like a speeding freight train. I wanted to run and get far away from this grisly scene, but my feet weren’t listening.